The pace of change is increasing, as evident in any organisation. The idea of periods of change then stability are very much in the past. The phrase of ‘the perpetual white waters of change’ reflects the new world order and this is only likely to increase, given the rate of technological change and the impact this has on us and organisations. Elizabeth Kubler-Ross’ grief curve has been adopted in management circles to reflect how employees react and respond to change. We can use this to recognise how people are feeling and help transition them through it. Taken literally however, her model can be read as going through the change curve, the change ends and you move on. This is not a complete picture. 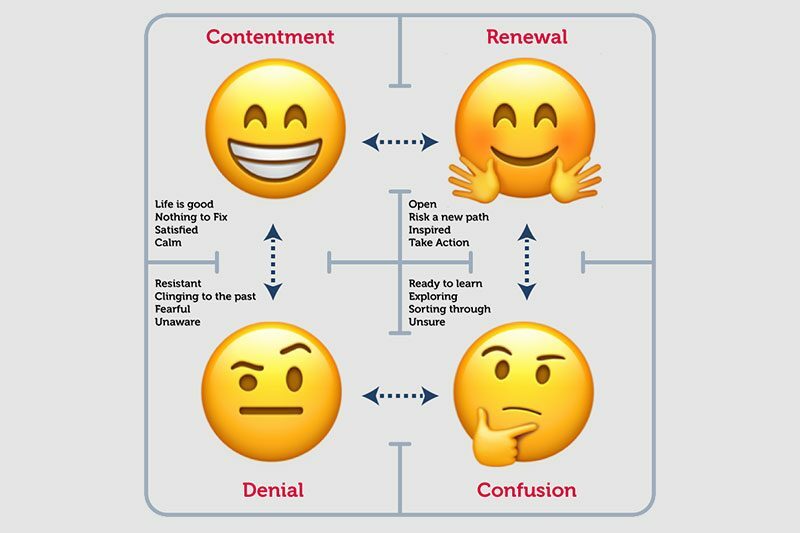 Claes Janssen during 1964-75 created the ‘Four Rooms of Change’, (often erroneously known as the ‘Change House’); whilst it is used as a psychological model it also is a valuable tool to help people understand and move through elements of change. Room of Denial: Where people and organisations recognise change is happening, but believe it won’t impact upon them or doesn’t apply to them. They don’t see the threats and instead believe they are ok and perhaps even blame others, thinking the threat will be short lived or of little impact. At the extreme end of this people can end up ‘ostrich like’ in the Dungeon of Denial where they are stuck in their mindset. Change is ongoing, the Four Rooms of Change encourage us to keep moving and being aware of not spending too long in any one room as there are risks. Coaching and leaders who know their people, teams and organisations can pick up the indications of where people might currently sit and begin to raise awareness of the situation. These people are uniquely positioned to identify, challenge and create momentum around change. It is creating awareness that is key to enabling personal change. 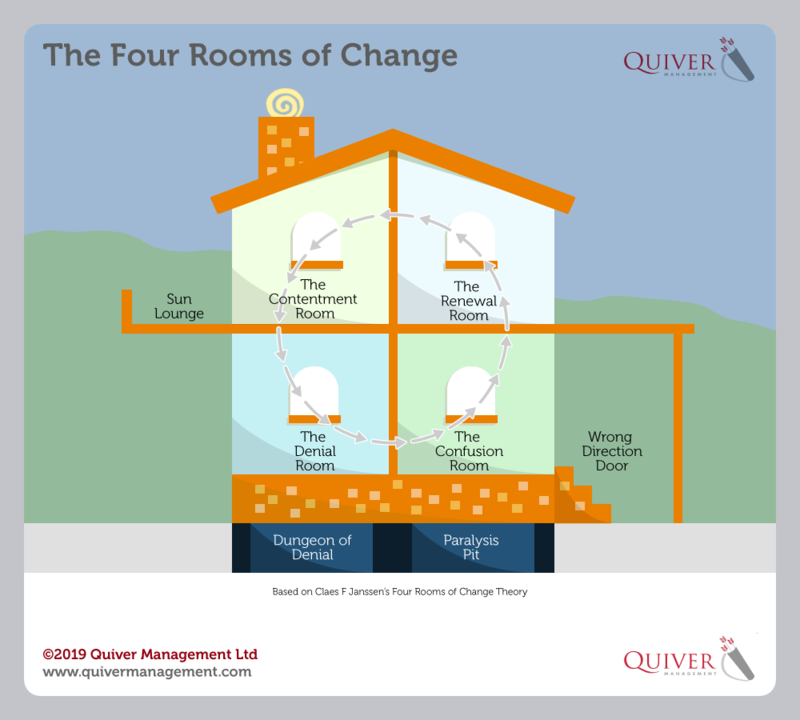 An example of using this model in real time… One coach in an organisation going through significant change asked Facilities Management to create a mock-up of the Four Rooms in a spare office. Each room then had a coach in it and people were encouraged to place themselves in the room they felt most reflected where there were at that time. The coach then explored the room with them to identify how they were feeling and what they could do for themselves to move out from it. This might seem a bit extreme, but nothing stops us from creating team activities which enable similar scenarios to be worked out. Change is inevitable, it is how we respond and manage it that determines how we successfully and continually transition people through it. In part 2 of this article, we will focus on how coaches and leaders move their people between the rooms with just the right level of challenge.